The Matrix Reboot Is in the Works, And We're Not Sure Why | Nerd Much? According to The Hollywood Reporter, we’ve got a Matrix reboot on our hands and Zak Penn (The Avengers) is in talks to write the first draft of the script with Warner Bros. Thus far, it looks like the original scriptwriters and directors (the Wachowski siblings) won’t be involved, but there might be some interest in Michael B. Jordan (The Wire) being in the starring role. The original producer, Joel Silver, likely won’t be involved either since he sold his rights to the IP to Warner Bros. back in 2012 for a whopping $30 million. This is yet unconfirmed, but Silver also has a known reputation for budget-control issues and an unhappy relationship with the original scriptwriters/directors. 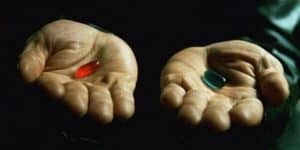 Though some of us might feel that The Matrix was very much a product of the time it was produced (or a golden classic among the greats like Citizen Kane), Warner Bros. is clearly running after the sequel/prequel bandwagon. Some might say that bandwagon is riding to hell in a fast car, as we all try to forget Fan-4-stic or the Total Recall reboot. Hopefully this reboot will turn out more like Rogue One: A Star Wars Story, rather than Indiana Jones and the Kingdom of the Crystal Skull. Maybe we’ll see the story of the machines instead, and how they advanced to the point of building the matrix. Do you think The Matrix deserves a reboot? What could they do to improve on the story? Let us know in the comments below!